1. Preheat oven to 400 degrees F. Place tomatoes, onion and zucchini in a shallow pan (a cookie sheet with sides works well), mix in the olive oil, making sure to coat all the vegetables, and spread into a single layer. 2. Place the vegetables in the oven and roast for 10 minutes, or until the edges start to brown. Stir and roast for 10 - 15 more minutes. The vegetables should be very soft and slightly browned. 4. Stir the herbs into the vegatable mixture. The tomatoes should smash up and make a kind of thick sauce for the zucchini and onions. Salt and pepper to taste. 5. Put the chicken breasts on plates and spoon the vegetable sauce over them. Tasty! The perfect solution when you have an abundance in your garden. Well done! Here chicky, chicky! I don't see the chickens. Did they all read this and run away... sounds good, we will have to try this! What a great way to use up abundant veggies. 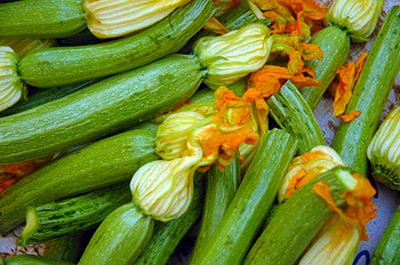 I am always looking for recipes that use zucchini. Oh yum!! Those look wonderful, unfortunately our garden has already quit producing tomatoes and zukes for quite some time now, boo!